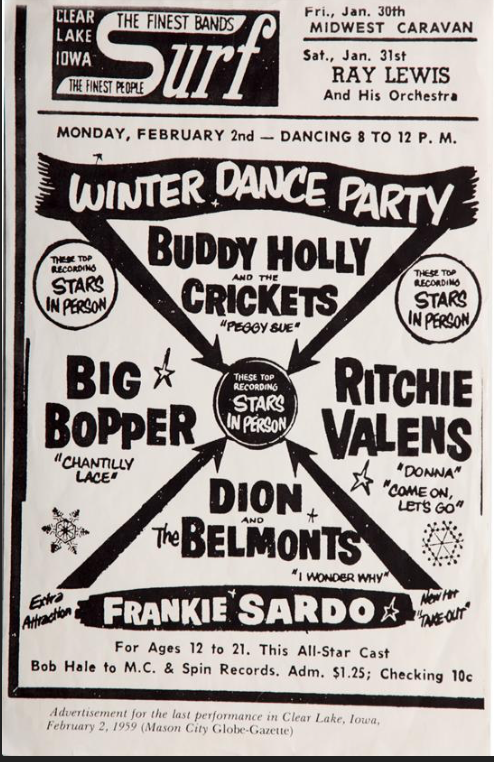 MSE Creative Consulting Blog: 60th Anniversary of "The Day the Music Died"
Sixty years ago this morning, Buddy Holly, Ritchie Vallens and The Big Bopper died shortly after take off from the Mason City, Iowa, Airport in bad weather. Waylon Jennings was supposed to take the flight but The Big Bopper (J.P. Richardson) had the flu and convinced Jennings to give up his seat. I suspect the Super Bowl halftime show will be as insipid as usual this evening. 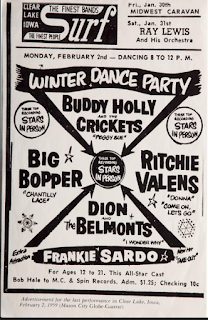 Think what could have been done -- if they had an ounce of creativity -- and decided to celebrate the music of the people (including Waylon, Dion and the others) who were involved that fateful evening 60 years ago.